This rings in the photos have sold. 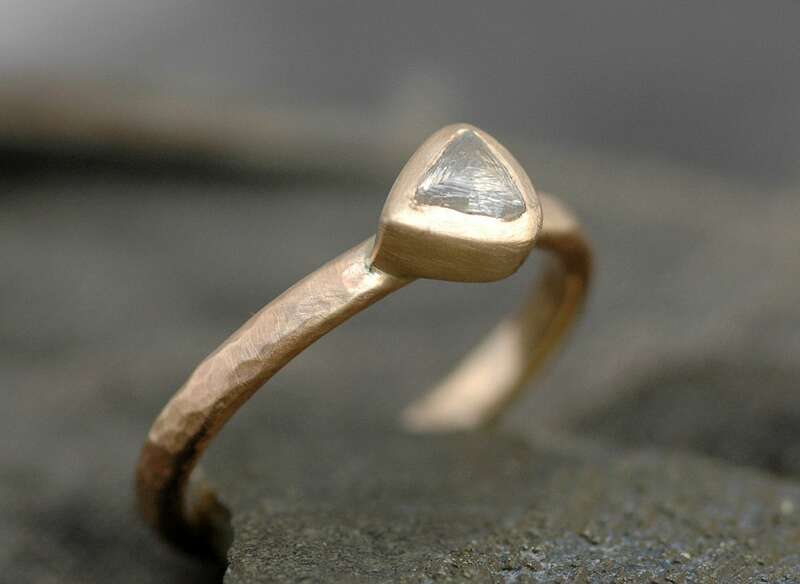 I have more stones of this size and clarity; please get in touch to have your own custom diamond ring made for you. 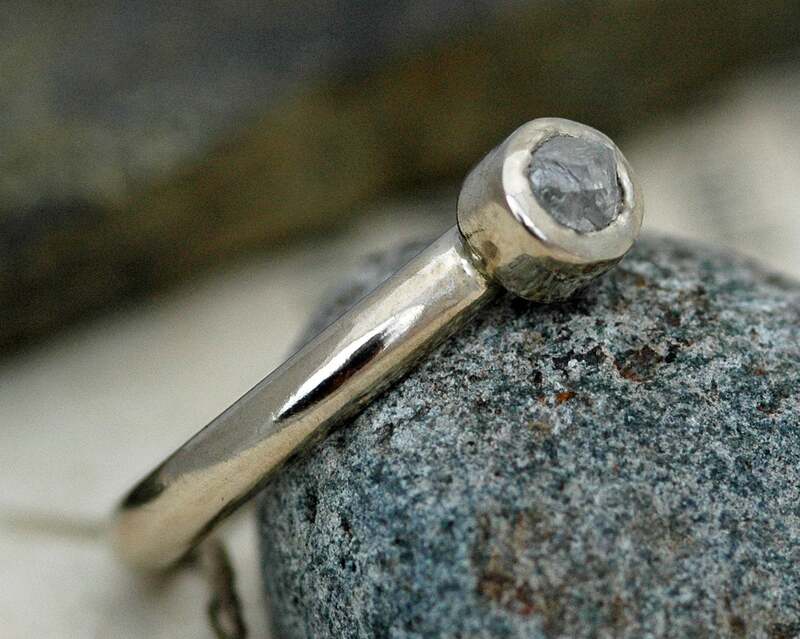 You may also have your stone prong-set, instead of bezel set, using this listing- please make a note with your preference in the 'note to shop' box during checkout. 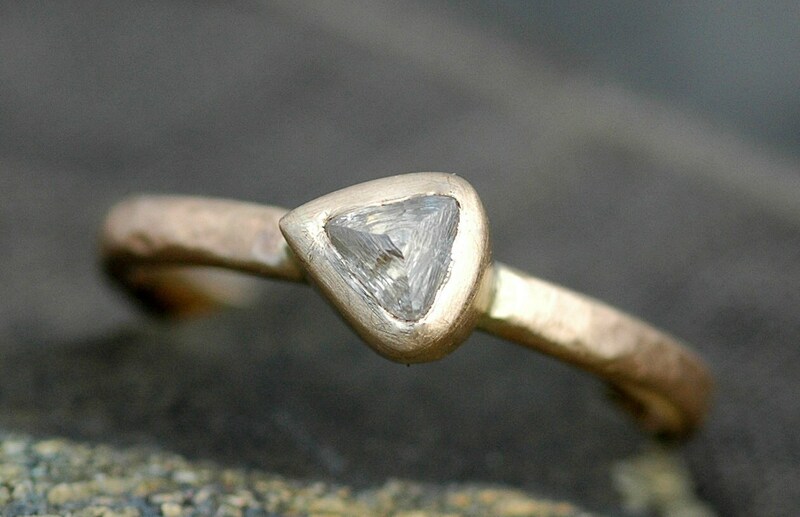 This ring is built around a gorgeous, shimmery, eye-clean rough diamond. My rough diamonds are certified conflict-free. They are also ethically purchased by my dealer. The rings are solid gold, in your choice of karat and colour. The gold is certified recycled, and comes from an American smelter with over 100 years in the business. They operate their smelting plant at the highest possible environmental standards. With these rings, you can rest assured that you are getting the most ethically-sourced, environmentally-sound engagement ring possible. 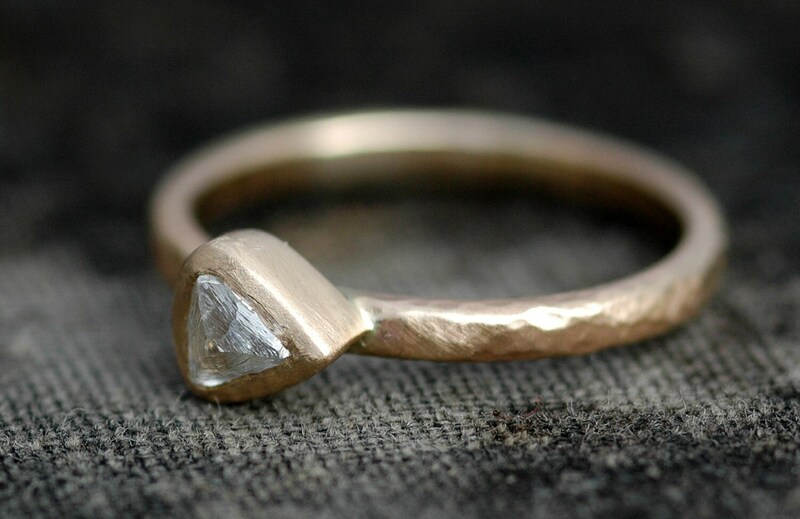 The yellow gold ring shows a hammered, brushed texture. This particular diamond is a triangular-shaped macle. It has an intricate, striated surface, no visible inclusions, and a clear, white colour. The white gold band shows a high-shine texture. The diamond is a crystal formation, and has a rounder form than the triangular macle. I have these diamonds (about 4mm a piece, but larger are available at an additional cost) in both shapes. The diamonds in the listing are around .35-.40 carats in size. These diamonds are VS clarity, and are very white in colour. 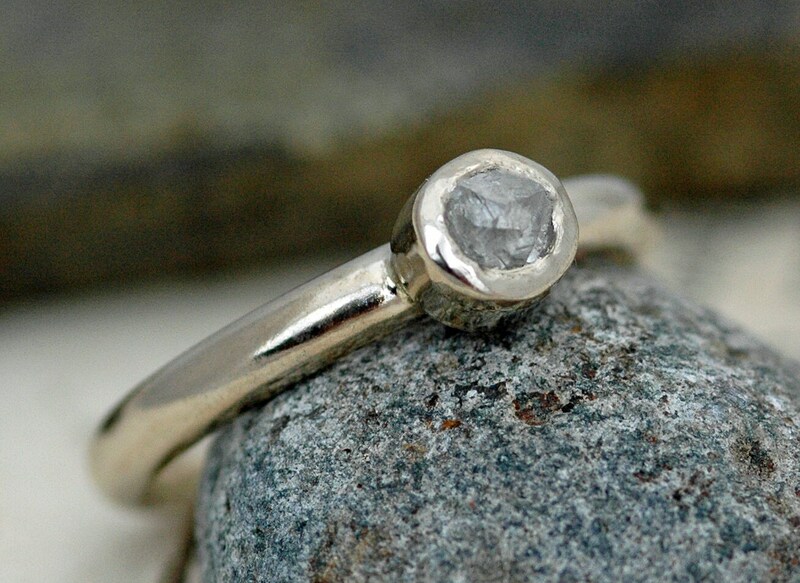 Raw diamonds are difficult to photograph properly- these stones have more shimmer and shine than I can show in these photos. The bands on these rings are a 2.5 x 1.5mm half-round profile. This is my most popular ring band. Flat/rectangular profile bands are also available. Also, I can make these in any width from 2mm to as wide as you would like. You can check out the appearance of these finishes in my shop. Please note that I do not rhodium plate my white gold- I much prefer the warm colour of white gold when it is not plated. I also prefer my rings be as maintenance-free as possible- plating needs to be redone yearly.